No one wants to worry about bothersome pests while relaxing at the lake. Call Prairie Pest Control so we can safely treat the interior and exterior of your property, leaving you with peace of mind. Prairie Pest Control and our friendly, knowledgeable staff always treat with environmentally safe products applied by a licensed applicator, keeping your pets, friends and lawn ornaments safe. Not only that, but our applications are odorless, meaning your interior treatments won’t cause any disruption to your daily life. We treat lake homes, garages, sheds and other structures, lawn furniture and ornaments, decks, fire pits, as well as full yards. Whatever your property needs, our staff is ready to assess the situation and offer informed solutions to all of your pest problems. Some common lake pests we’re ready to help you deal with are spiders, ants, asian beetles, box elder bugs, cluster flies and mice. Let us treat your home and lawn so you can soak up some rays without any worries. Spider eggs hatch in spring to late summer, so we highly recommend two treatments per season for the most effective results. 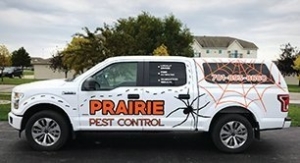 Prairie Pest Control is guaranteed to remove your spider problem. Not only that, but Prairie Pest Control will sweep away any webs left by the eight-legged pests as part of our treatment. Ants thrive in the sandy soil up at the lake, and many lake homes and their yards will suffer from ant infestations. Prairie Pest Control is well-equipped to handle your ant infestation, treating areas both indoors and out. If you don’t want ants in your yard, sidewalks, patio, driveway or home, let Prairie Pest Control eliminate the problem with our guaranteed treatment. There’s a solution for all these common pests as well. Give us a call and our licensed technicians will assess the situation and eliminate those unwanted pests through exterior, and possibly interior, treatments of your home. You’re probably familiar with common mice extermination techniques that you’ve tried on your own, and you’re probably familiar with the low success rate of these techniques. Let Prairie Pest Control’s trained technicians administer our effective mouse extermination methods — success guaranteed. Prairie Pest Control is guaranteed to eliminate your pest problem. Schedule an appointment with us today to receive your free estimate. Get the solution to your pest control problems in the MN lakes area and call us today!